Colocasia is a genus of around 25 tropical species of lovely foliage plants known for their large, ornamental leaves. These tropical plants are suitable as waterside plants where they provide a spectacular show of fresh green leaves and fill empty spaces. Colocasia can also be grown as border plants, in mass plantation schemes or just as ornamental patio plants. Native to tropical climates, Colocasia requires moderate temperature and protection from freeze and frost. Most species keep producing new leaves throughout the year except in winter when they go dormant. This is the time to replace these plants with winter plantation and store the tubers for next cultivation. The leaves and tubers are used in a number of traditional recipes as food items in many parts of Asia. These edible tubers have many names – Taro, Dasheen, Eddo and Arvi. 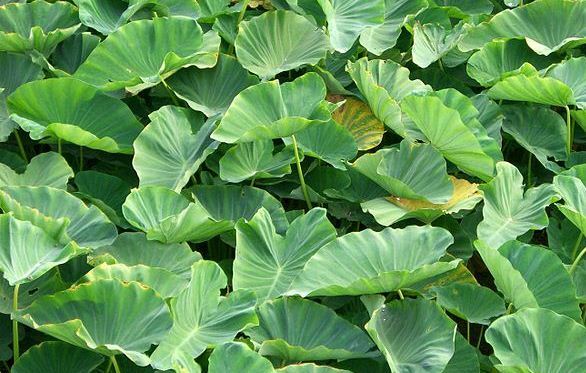 Colocacia Esculenta or Elephant’s Ear, being the most popular species, is grown widely in tropical climates as ornamental plants – majorly for their large leaves. Flowers are white insignificant spathe and are produced in summer. Most species of Colocacia prefer sunny climate and plenty of water.